IDEA BOMBING - THE GALLERY EDITION. "Idea Bombing gives us the opportunity to stop, listen and think. Part meetup, part popup bar, talk series and community brainstorm, it's a new way to engage, surface creative ideas and promote ways of turning those ideas into reality. Since May 2013 Idea Bombing has been kicking up an idea storm, encouraging the people of Sydney to envisage what the future holds for our beautiful city. Idea Bombing Sydney focuses on untapping creativity in everyone and anything in a fun, social way: after a series of short talks, guest speakers bomb ideas to the crowd and then participants are asked to ‘bomb’ their ideas for what would make Sydney better, with great tunes and drinks on hand. We love collecting, analysing and sharing idea bombs. By doing so, we aim to complete a circle, connecting people, connecting ideas and connecting people with ideas. We are passionate about providing meaningful feedback to the community, the event host and Government policy. Ultimately, we aim to seed our city with ideas in the hope they grow to create new spaces and places in the city. Idea Bombing Sydney was founded in 2013 by Melinda Garcia and John O'Callaghan." "We've teamed up with Object: Australian Design Centre to give you The Gallery Edition – 7 weeks of some of the most creative and innovative design concepts in Sydney right now. Come and witness the pop up installations of past bombed ideas, and help answer these questions: 'how we can make Sydney's art spaces better? ', and 'how design can improve our everyday lives?" We've lined up some very exciting speakers to inspire and get your creative juices flowing before we let you take the stage to drop your own ideabombs! As part of the Gallery Edition, we'll be asking you to drop idea bombs on 'how design can improve our everyday lives?'. Like our past events, we'll have speakers to tell us what inspires them whilst inspiring us, the ideas wall (although in a slightly different format) to bomb your thoughts on how we can make Sydney better! 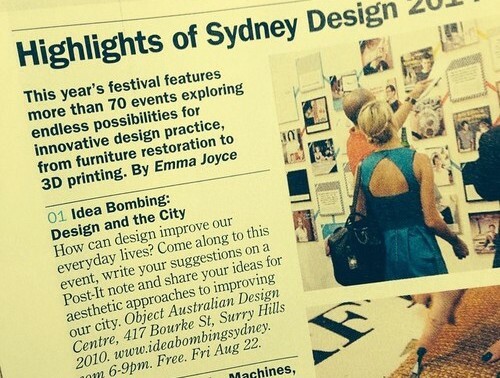 Idea Bombing Sydney: The Gallery Edition will run for 6 weeks from 7 July 2014 to 23 August 2014 and split into two parts.